My intention was to focus on Alaska's interior this year. 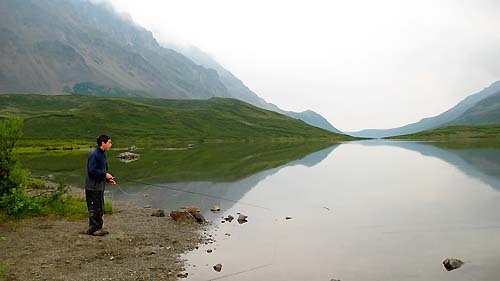 However, we never pass up an opportunity to fish Peter's Creek. 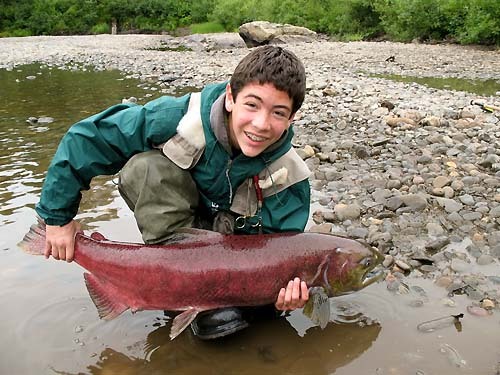 The water was low this year which delayed the salmon runs. That's a king well into it's spawning colors. Our adventure really started on the Denali Highway. This 'highway' is actually 120 miles of dirt road. But that was a good thing as it's almost untraveled (picture baja over 30 yrs ago). The first time I really felt I had reached the 'interior' was at this spot, which, by the way, I grew to love and kept coming back over and over. We arrived here at dusk and there were rings all over the lake. We quickly assembled our rods and virtually ran down to the shoreline. I was so excited knowing they had to be grayling. Wade out deeper and put it on top of him - nothing. Change to a smaller fly - nothing. Change to a sinking line - nothing. Strip the line faster - nothing. Use a leech pattern - nothing. A midge pattern? - nothing. They were still rising as we walked back to the car and got ready for bed. But what a wonderful spot. We'd wait for the sun to bake the vehicle to just the right temperature before even thinking of getting up. Breakfast was a lazy affair interrupted by long pauses of staring blankly at the water. The entire area was covered by brush with virtually no trees to break it up. Why I could probably spot a grizzly 500 yards coming towards our campsite. The next spot I want to show you was the visual highlight of the trip. 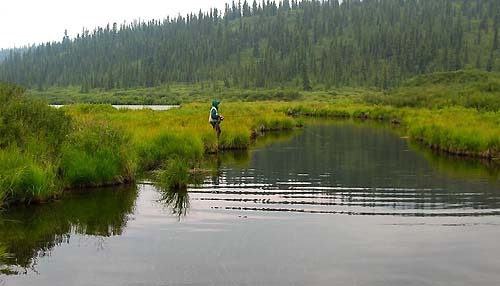 We went there for the lake trout and grayling but soon realized how trivial that was. It's impossible to convey the feeling on film. We are at the end of a massive U shaped valley that was entirely filled by this body of water. The distances were so great that my lens was incapable of getting it all. I finally chose the side with the more dramatic cliffs and hoped for the best. There was a lot of wind at Landmark Gap but it was at it's finest when the lake was perfectly still. Some puffy clouds could have helped but that was not to be. We caught numerous grayling at the outlet and kept 5 for dinner. They were just small enough to fit into an 8" skillet. Alex had found 4 large wild mushrooms which complemented the fish nicely. We met no one here for the entire time other than a canoer who pushed off from this spot to distant shores. He paddled right through that little opening you can barely see in the distance and disappeared from view. 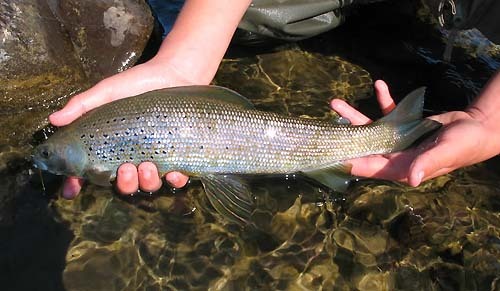 We knew that grayling were not going to wow us with their size but we still wanted something larger. I had heard about the Clearwater River that crosses the highway at midpoint and 6 dusty hours later we arrived at the 'campground'. Campgrounds up there are different from what you and I have grown to expect in California. They're usually just a patch of level ground layered with gravel and a outhouse in one corner. The Clearwater turned out to be fast and wide. The fish were not numerous, but large by our standards, 14"-18". 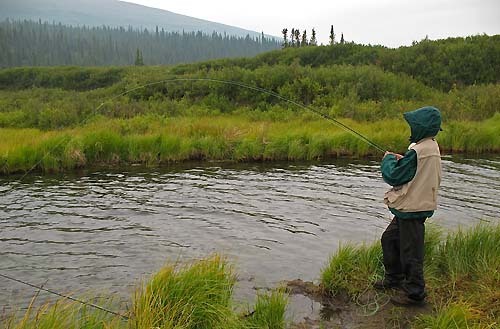 Wading was tiring as the river had to be crossed repeatedly to fish the lies properly. I chose this image so that you could see some of the subtle beauty of this fish. The dorsal fin has the same coloration as the pelvics you're seeing. 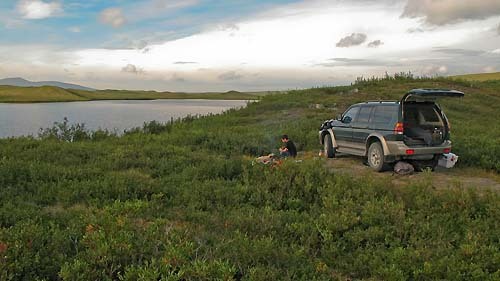 By this time we had become spoiled with the hamburger dinners at the Tangle Lake Lodge and soon left the Clearwater for a warm meal and a pancake breakfast. 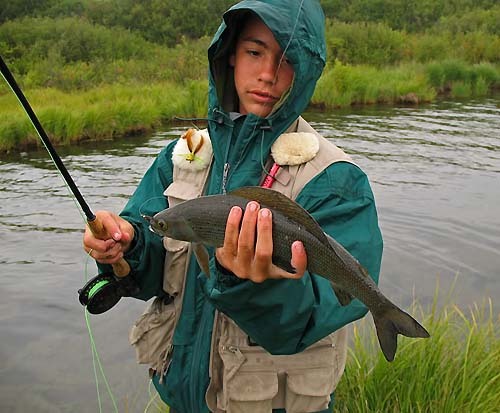 As often happens on these journey I met a traveler there who told us about the grayling at Swede Lake. The lack of rain made it possible to drive the ATV trail to within a mile of the lake. Oh, heh, I guess I should tell you this episode. You might get a kick out of it. The trail was so narrow that the brush would scratch the sides of our rented vehicle in many places. Eventually we came to a spot that looked like soft mud, a spot that spelled trouble, and I refused to go further. There was no place to turn and backing up a mile on that trail seemed impossible. Fortunately I had bought Alex this enormous bowie knife with a 9" blade for Christmas (which Alex tried to bring on board as carry-on, but that's another story) we used it to hack out a spot wide enough to turn around. It was tiring, unpleasant work but fortunately there were blueberries everywhere making the task considerably more enjoyable. The trail came down this cliff to a bog and seemed to disappear. Our waterproof shoes were useless here as we stumbled through ankle deep water. Attracted by our sweat the mosquitos were all over us as we trudged through the mud to the lake's inlet. I think the sweat would wash away the deet cause it didn't work very long in this bog. Well, the guy had been right. It was wall to wall grayling. And they were of a good size. I must've caught 10 fish on my first 10 casts. Then I switched to bluegill poppers and they took that. Then I switched to bass poppers and they took that. Then I switched to mouse patterns and they took that. What can I say? We were in grayling heaven! To be honest, after what it had taken to get there, I didn't think Alex would be up for another day at Swede Lake. But he surprised me ( and I never say no to a fishing ) and we came back to this spot two more days. It rained the last day. All I remember now is huffing up that cliff in the rain and then hauling back to that lodge. It was beautiful, though. Glistening leaves with blueberries beneath. And an occasional mushroom peaking through the litter. back down to where I started from. It was wonderful. A light rain started to fall but nobody seemed to notice or care. In fact we ate our sandwiches in the rain. Lunch was an affair where everyone was talking at the same time about their particular encounter with a bear or char. The bears were everywhere. They followed trails at the water's edge looking for opportunities. Then they would come dashing out in a spray of water to pounce on some hapless salmon. These guys must have been stuffed with salmon cause we saw dead fish everywhere. The protocol when meeting a bear was simple. If he crossed the river to your side you crossed to the opposite bank. The first bear made us real nervous. But the more we encountered the less we worried. It was not uncommon to look down river and see someone wading from left to right with a bear just below him going right to left. The only one that gave us trouble was this giant male that had parked his rear in the middle of the creek and just sat there. The guide even had a name for him. I never developed the courage to advance on this one and just bushwacked it through the pines to get around. 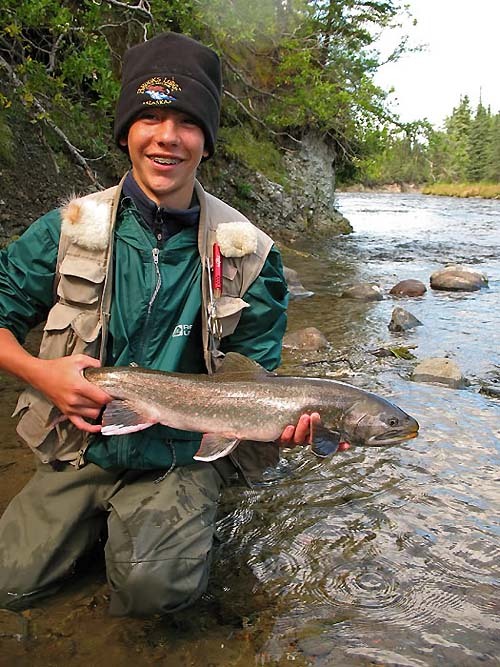 The arctic char is a beautiful fish that resembles our brook trout. I was told that you could tell the males from the females from the shape of their fins. I believe the one in the upper image is a male with the female in the lower one. For some reason that nobody understands only char come up this creek from the lake whereas only rainbows enter the Brooks river just a few miles away. 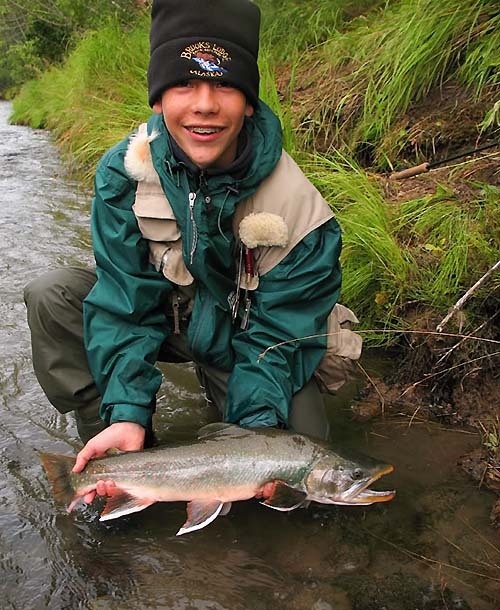 Most alaskan rivers have both, so this was very unusual. We made 3 all day trips to Margot and plan to return again some day. Oh yes, the fly on Alex's right shoulder is a 'flesh fly'. It's the color of salmon flesh. Char will feed on dead salmon that come drifting by. They work fine but bead eggs are much better in my opinion.